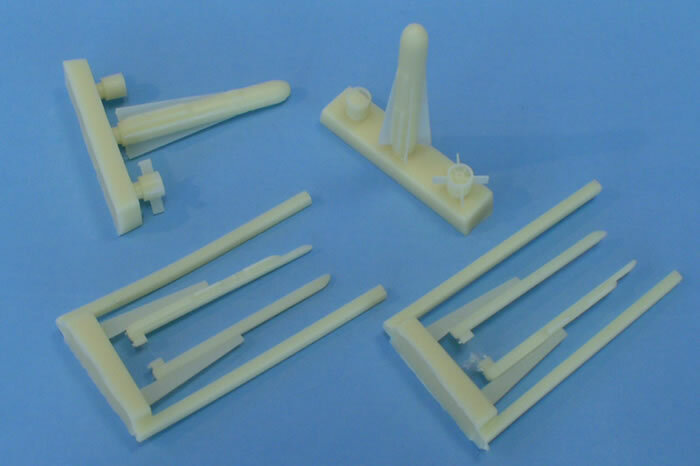 Maestro Models have released more resin armament sets in 1/72 scale, the three reviewed here having application for the SAAB 37 Viggen and the JAS39 Gripen aircraft. 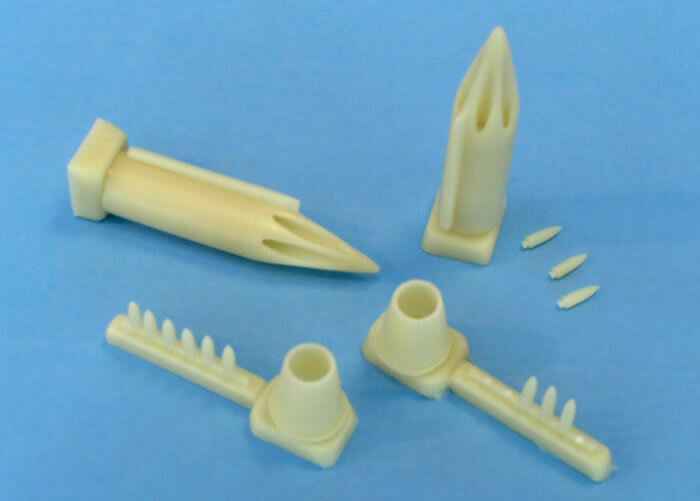 This set contains sufficient parts for two rocket pods as used on the SAAB37 Viggen and six rocket heads per pod. Some elementary construction will be required, in that the tail section of the rocket pod (rear third) must be joined to the forward section using an appropriate adhesive. The separate rocket warheads may be added according to the modeller’s taste, in order to depict an empty, partially-loaded or full pod. There is commendable depth and finesse to the openings at each end. 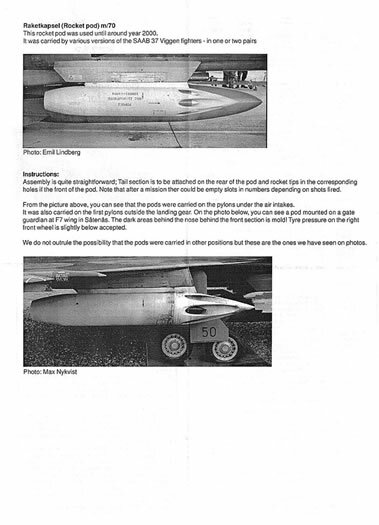 The instructions offer assembly advice and provide guidance on which pylons these pods may be mounted on. All components can be separated from the pour base with minimal fuss and will only require a few passes with file or sandpaper to ready the parts for joining. 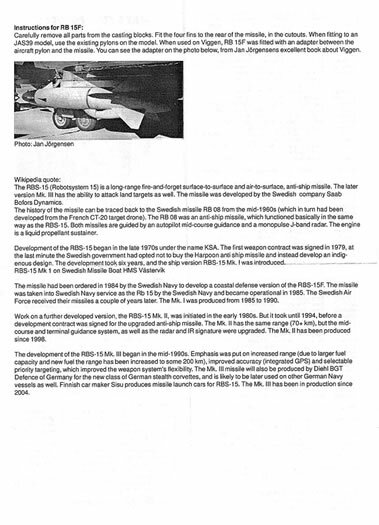 Maestro’s set of RB 15F missiles depicts a pair of these Swedish anti-shipping missiles as carried by the attack versions of the Viggen and its replacement, the JAS39 Gripen. The large missile body is cast with all four forward fins attached while the four larger aft fins are separate items. There is some lovely detail moulded onto the missile body, especially at the rear of the missile. Separation of the body from the pour stub should be easily achieved with careful work and will only require a quick clean-up of the nose section. The larger fins may be removed from the casting block (four per stub) with minimum hassle and then attached in shallow slots on the body. 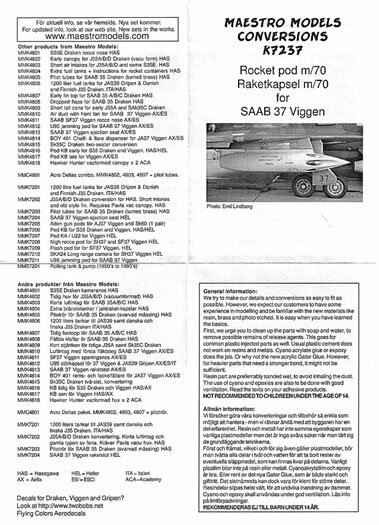 The instructions note that the Gripen carries this missile without pylon adaptors and the Viggen carries it with adaptors; unfortunately these are not provided in the set but a photo included in the instructions (a reproduction from the Airdoc title Swedish Viggens by Jan Jorgensen) shows the missile attached to the adaptor on an outboard pylon and should suffice as a guide to the modeller building their own. 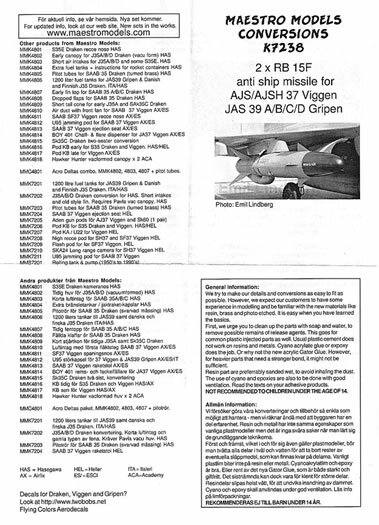 This set contains a pair of AGM-65 Mavericks (known to the Swedes as RB 75) and four launch rails, two of which are for use on Swedish Viggen and Gripen aircraft and the other two depict the more commonly-used LAU-117 rail. Photos and guidance provided in the instructions make it clear to the modeller which rail is which. 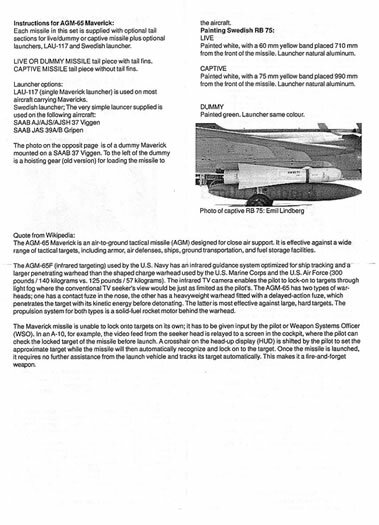 Maestro have provided options with the missiles as well, offering alternate tail sections to place on the main missile body so as to represent either a live missile (with aft control fins) or captive missile (without fins). The fins on both the main body and optional tail section are moulded on and are very fine, enhancing the appeal of this set. The instructions assist the modeller to paint their RB 75 / Maverick and the relevant rail with guidance on colours and band placement. 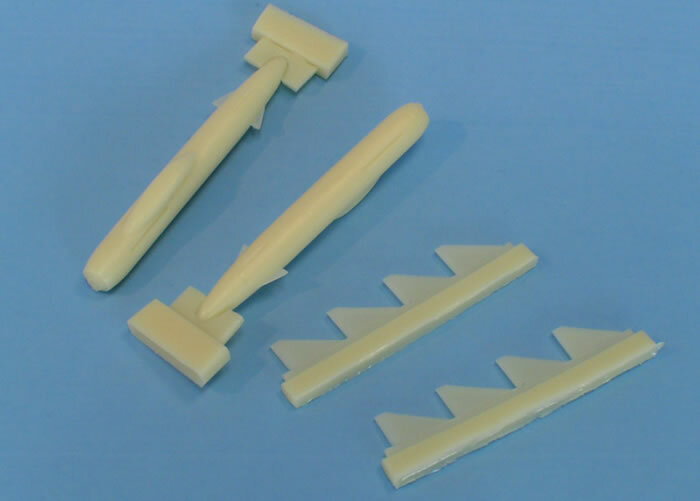 These are straightforward resin upgrades in 1/72 for either Viggen or Gripen aircraft and will require little modelling skill to enhance a model with authentic Swedish weapons. 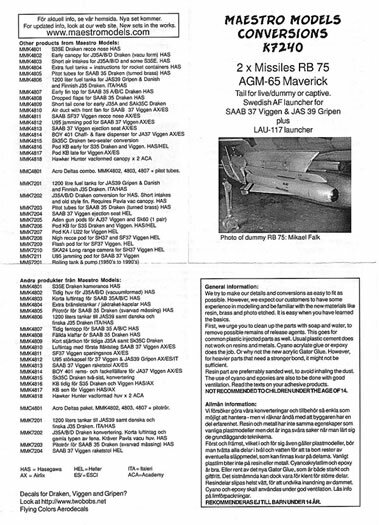 In the case of the Maverick set, they have additional application beyond Swedish jets, thanks to the thoughtful inclusion of the more common LAU-117 rails.